It's time to put down your weapons and calmly welcome our duck new overlords. On Saturday, motorists driving through the wind-swept roads of Glasgow, Scotland, were visited by a rather strange sight — a monstrous inflatable duck the size of a small building casually trundling its way along a hectic four-lane road. 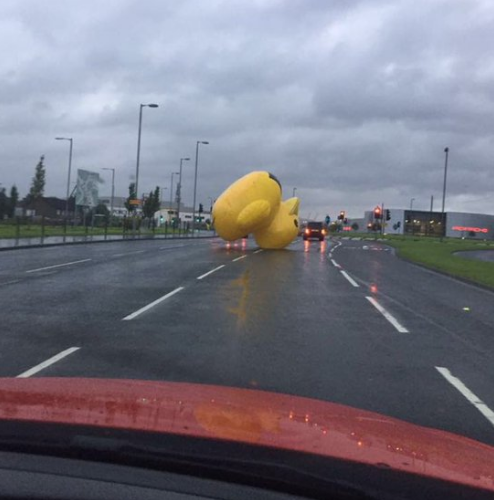 See Sam Haysom’s article, including video, at http://mashable.com/2016/09/26/giant-inflatable-duck-glasgow/?utm_cid=hp-h-3#LUv_JKy85SqD.